The Google Barge is fascinating not for what it is but what it could herald: a future where our retail stores come to us rather than us to them. For those who may not know, Google has a mysterious project under construction in the San Francisco bay. 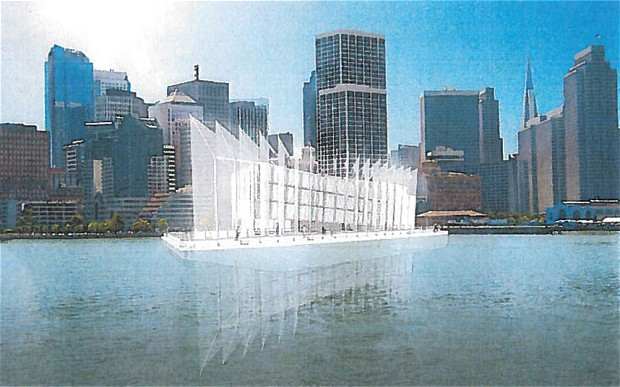 We know it as the Google barge and it is covered in scaffolding, cloaked in secrets. Such secrecy is rarely seen for such a visible project. As an intended result, it has garnered quite a bit of attention. Some thought it was a data center. Others thought it was a retail outlet. Or maybe, given the skyrocketing prices for housing in San Francisco, it was some sort of corporate-sponsored boathouse. No one would say. City officials didn’t know. Google was mum. Last week, new information lifted the shroud. We now know that the barge is intended to be “a temporary exhibit space”, some sort of floating visitor center to celebrate Google and its products. Or maybe the corporate marketing is ancillary. It could simply be a tourist destination. Either way, the principle function as a barge is to station itself at various waterfronts along the west coast for a month at a time to do whatever-it-is it will do. Personally, I hope the barge becomes a full retail destination. Not that I particularly care for Google Glasses or Chromebooks. They’re fine products. I’m just more interested in a floating retail space because it could crystallize the gradual, eventual mobilization of this thing we call “The Store”. The Google barge makes me ponder the real possibilities for mobile corporate retail. Such a mobile retail outlet can be to the brick-and-mortar store as the food truck is to the brick-and-mortar restaurant. The food truck industry has proven there are real benefits to this model. These benefits are transferable across any consumer industry. Mobility, convenience, unique customer experience, and limitless selection through on-demand ordering are the dynamics that hold sway. It is these dynamics that have already driven the “big box” to its last breath through online retail. The Best Buys of the world are shrinking their footprints. If and when they add new stores, the stores are much smaller. In fact, today’s Best Buy is more likely to be an in-line tenant at the shopping mall rather than the anchor of old. So small is sustainable; small is convenient; small fits the market. Even Wal-Mart has taken notice with their “neighborhood” stores. The trend can run deeper with mobile spaces. In the past two decades, retailers have built massive distribution networks, responsive shipping and fluid inventories. Using these resources, I can imagine corporate kiosks “bombing” a street with something akin to “tactical retail”. Or Amazon putting up a Kindle lounge in a great public space to introduce their goods to the public. Speaking of which, we’ve seen a bit of this already with a recent Kindle ad. The only missing piece is for these consumers to actually buy the Kindle at this same pop-up lounge. And speaking of Amazon, this is how the company could overcome its challenges in the clothing sector. Set up a weekend bazaar to let people actually try on the clothes or at least feel the fabric before risking an order. There’s nothing worse than buying a medium t-shirt online only to receive something the size of a bedsheet with the word “Medium” brazenly printed on the tag in defiance of the word’s meaning. So imagine a world where the next major retail destination is actually a moving target. Not a road show, per se, but a nomadic space that sets up in surprising places for brief periods of time. Grabbing attention, drawing lively crowds, moving units, then moving on. Or maybe it is more formal. Maybe these shifting, moving storefronts occupy a brick-and-mortar building for a month at a time, giving themselves the ultimate optionality. They can rent for a month in a formal space and if traffic slows or the customers move elsewhere, simply pull up the stakes and follow to the next spot. No more legging out a ten-year lease in a dying area where you face the potential of a bad neighbor next to your pristine store. In some places, these stores could simply locate for the holiday shopping season and leave. I find a fluid city of these shifting destinations to be wildly exciting. The model allows us to get around the conflict of permanent storefronts built to catch fidgety, flighty consumer trends. That current model simply carries too many costs. We can point to countless empty big boxes as the detritus of corporations following the traffic and trend of the day. Those soulless shells become dead zones. We look back on them and wonder if they were ever worth having. Smaller, mobile retail bypasses these risks. This model also outmaneuvers our latest repackaging of the big box which we call “lifestyle centers”. I actually like these centers but they are still vulnerable. They are not built on decent courtyards and right-sized parking. They are built on long-term leases. And when those leases end in 2027, I suspect all we will have left is a lot of very nice flea markets (i.e., the original mobile retail). But here’s another benefit: mobile corporate retail can bring the customer experience to the customer. What if the next specialty retailer, like a Lego store, brought itself to a smaller city for a three-week visit? Rather than requiring those residents to drive countless miles and hours to arrive at the mall, the mall would essentially come to them with on-demand orders and product demos. The customer saves money and time, the retailer saves (again) on leases, storage, and more. One can imagine a town festival with corporate tents intermingled amongst the independents. Adidas places a booth on the square to show their latest line of shoes. Suddenly, a micro real estate market is born as mom-and-pop sellers try to position their tents next to Adidas. It’s anchor and in-line all over again. And everyone benefits. More traffic, more spending, more people at the festival, a rising tide that lifts all boats. In closing, the Google barge is the germ of a great idea for mobile retail. It is a way to subvert the idea of the store just as food trucks subvert the idea of the restaurant. As a business model, it (probably) won’t take over the world but I hope its comes around and visits my city, if only for a little while.